Bridal Hair Styles - Which Wedding Hair Style Is Best For You? How To Determine The Best One For You! Now that you have the perfect wedding dress are you thinking about bridal hair styles? Have you been pulling wedding hairstyle pictures off the net and wondering how those styles would look on you? Would one of those fancy up-do bridal hairstyles be your best style or should you wear it down? Should you go curly or straight, long or short, or even half up or half down? You have to consider the texture and length of your hair to determine which wedding hairstyles will look best on you. Also remember... before you can choose your tiara, hair ornaments or veil you need to know how you plan to wear your hair. Yes, you need to make sure that your hair style compliments your dress. Especially if you are wearing a wedding dress that has a theme to it. For example, if you are wearing a vintage wedding dress style from a particular era, you may want to wear a hairstyle that reflect that time. "Hollywood glam" is a theme that puts you in mind of certain hairstyles from old Hollywood movies. For most wedding dress necklines, an up-do bridal hair style works. But when would it be best to choose a style where you wear your hair down or do a combination of an up and down hairstyle? Say for instance your gown has sleeves, comes up high on the neckline or has a collar... you should consider wearing your hair down. Make sure you do a style that has al lot of volume, bounce and body. If you want to do an up-style try the half up and half down hair style. If your gown is low cut off the shoulder... choose a bridal hair style where some hair comes down onto your shoulders. You can still can consider an up-do, but you should make sure that some hair is down, even if it's only a little, to soften the style. If your gown is simple in design... you should consider a more elaborate bridal hairstyle to create an interesting overall appearance. It your gown has a lot of details on it then do the exact opposite. To much going on will detract from your overall look. Your Bridal Hair Style Must Compliment You! Your wedding day hair style must compliment your face shape and body stature. If you are tall and thin... you should keep away from high tight up-do hairstyles. That will add more height to your profile. If you have a round face... you will want to shy away from a big curly hair styles. An up-do, half up and half down or an asymmetrical style will help slim your face. There are other areas that include the length of your neck, the size of your ears, as well as the height of your hairline that you need to consider when picking a wedding hairstyle. I know that this may all seem complicated. But this is where you need to consult a professional for advice. Here are some Wedding Hairstyle Tips. Get Help Choosing A Hairstyle For Your Wedding? It takes careful planning as you can see when choosing a hairstyle for your wedding. So where should you start? You can start looking at bridal hair styles online, hair magazines or bridal magazines. There are companies online that have hair style modules that you can use to help you choose a hairstyle that will look best on you. 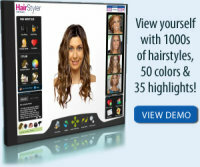 You can use the models on the site or place a photo of yourself in the module and then choose from numerous hairstyles to see what works for you. If you decide to try someone who you have never used before for your bridal hair style, it is very important that you have several practice sessions. Don't wait until the last minute, only to find out that the person you chose can't work the same magic on your hair that she did with your friends hair. Be sure to take your tiara or headpeice and veil with you for these practice sessions. 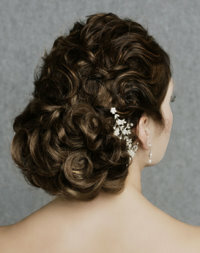 The stylist will need to see what you plan on wearing in your hair for your bridal hair style. Some headpieces or tiaras are on combs and other have be pinned in. Let your stylist know if you will need to remove the tiara or veil during your day. This way they can make it easy for you to do so. "I know of a bride who went to the hair stylist several times during the weeks leading up to the wedding. She went 3 times the week of the wedding, trying to nail down that perfect wedding hair style. This added additional stress for her at a time she need to focus on other wedding things. Don't let this be you. Have this worked out before the week of the wedding!"